QEM Solutions have created a business model that supports and maintains a respectful attitude to both people and places – whether it's our own staff, the communities we both work and live in or the planet as a whole. 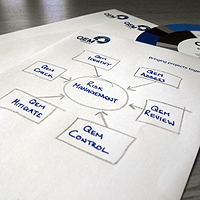 Being Accredited to ISO 9001, 14001 & 18001 since 2008, it is proven that QEM Solutions adopt good business strategy whilst ensuring our first priority is to care for our people and the environment. QEM Solutions' values and policies are engrained into the ethos of the company and this shines in the work we produce for our clients. Since 2003, QEM Solutions has built a reputation based on trust and integrity, not only with our clients but also our employees and associates. High quality standards and integrity are fundemental to achieving responsible working ethics which assist our clients complete the tasks they require us to do. It is our firm belief that responsible business practices result in a better business. QEM Solutions are dedicated to improving lives, both locally and around the world. We work within the water industry. So it seems only fitting that we choose WaterAid as our nominated charity. 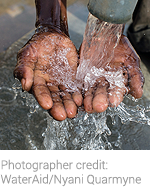 WaterAid's vision & mission is to be part of a world where everyone has access to safe water and sanitation. Having lived and worked in Africa our team have seen the desperate need for more help and assistance from organisations like WaterAid. And the fact that the majority of issues can be tackled with engineering solutions makes it something we feel we can genuinely assist with. To kick off the fundraising for WaterAid the QEM Solutions MD, Mr. Rob Graham, has stepped up to the mark and will be running The Edinburgh Marathon in May this year (with his dodgy knees). Let's wish him all the best and hope his knees don't crumble. We'll keep you up to date with his race in our news. On to a more serious note, QEM Solutions continue to support our industry governing bodies, with last year sponsoring the annual Pipeline Industries Guild (PIG) Northern Branch dinner held in Harrogate, where the industries elite gather. The night was a great success and thoroughly enjoyed by all. A big thank you, to all the people within the PIG who work tirelessly each year to organise the event.